Pinellas County roads are now more crash prone than ever. Forward Pinellas, a transportation advocacy group, just crunched the numbers and tallied up an average 77 crashes a day over the past 5 years. PINELLAS COUNTY, Fla. — Pinellas County roads are now more crash prone than ever. 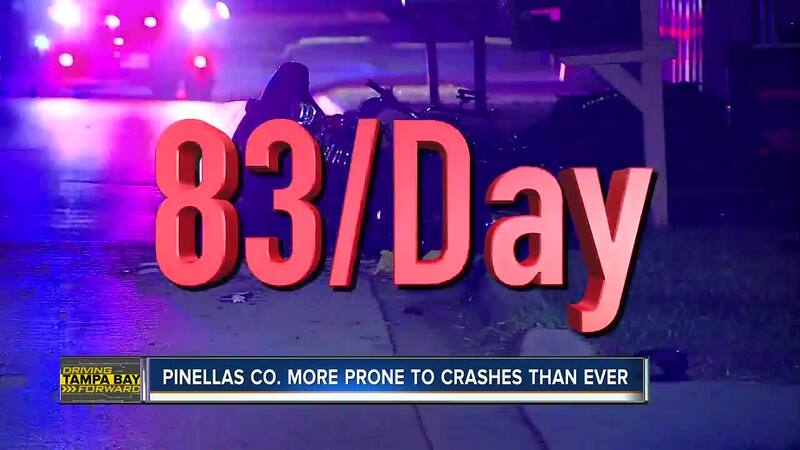 Forward Pinellas, a transportation advocacy group, just crunched the numbers and tallied up an average 77 crashes a day over the past 5 years. Traffic experts say three things are leading to a spike in crashes: Drivers and pedestrians disobeying traffic laws, distracted driving and in an increase in drivers/cars on the road from tourism and people moving to Tampa Bay. “It happens all the time,” Emad Elsawaf said while pointing to the intersection of 127th Street North and Walsingham Road in Largo. On Wednesday, two young adults were hit at the intersection crossing outside of a crosswalk. “I'll often be standing and talking to a customer, and the next thing you know, bam! slam!” Elsawaf, who works at a nearby jewelry store, explained. In 2017, Pinellas County saw 30,000 crashes, which is an average of 83 a day. Forward Pinellas also compared the past 5 years of traffic crash data to the 5 years prior and found crashes went up 9 percent overall. Pedestrian fatalities went up 6 percent, and the number of car accidents nearly doubled since 2012. “It’s very very extremely dangerous,” Michael Angel, who often drives along Pinellas County streets said. There was one bright spot in the new report: While bicycle crashes went up 5%, the number of bicyclists killed in crashes fell 21%. In 2012, 10 bicylists were killed. In 2017, that number dropped to 4. Whit Blanton, who leads Forward Pinellas, says more tourists and people moving to Tampa Bay make our streets a recipe for crashes. “You just have so many people trying to go in every direction!” he added. Building overpasses, including the ones planned along US-19. Widening roads and working on major new corridors like the Gateway Express Project. And adding more bike lanes and crosswalks, including some that are mid-block. Yet, transportation leaders say the safety of all of us hinges on one thing: People paying attention. “Absolutely! I look to the front, back, sides. You have to really be careful nowadays,” Elsawaf said. The US Census Bureau expects Tampa Bay to continue to be one of the most popular places for people to move in 2019. Traffic experts tell ABC Action News that will force them to get creative to keep the roads we rely on safe.